Back when I was doing Soviet studies at university (when there was still such a thing), vodka was the liquor of choice. Since becoming a cocktail geek, my tastes have run more towards gin and bourbon. Still, I was happy when contacted with a query to give Sobieski Vodka a try. Named after King Jan III Sobieski (1629 – 1696), this vodka comes to us from Poland. It is distilled from a base of Dankowski rye, harvested in the Mazowse region, and uses water from Oligocene-epoch springs. Sobieski employs a continuous distillation process which results in an 80 proof (40% ABV) product. I tasted the Sobieski straight and warm in a small shotglass. The initial scent is pleasant and mild, not too much alcohol on the nose. The taste is warm and peppery, with a bit of an oily mouthfeel. I tried the Sobieski in a traditional Moscow Mule. Build in a rocks glass (or copper mug if you happen to have one on hand). Fill with ice, add vodka and lime juice, and top with ginger beer. Garnish with lime wheel and serve with straw. This is a very pleasant drink. Lime and ginger are a classic combination, and any tikiphile can tell you. The Sobieski gives this base a bit of a kick, living up to the drink’s name. Put lime quarters in rocks glass and muddle. Fill glass with ice, add vodka and syrup, and top with soda water. Give a stir, garnish with lime wheel, and serve with straw. 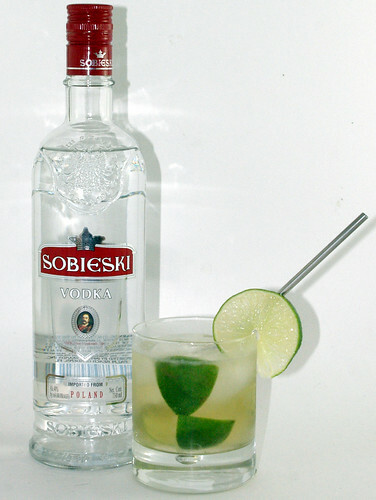 Sobieski also made a great Lemon Drop when I experimented with recipes for the Guilty Pleasures Mixology Monday. Sobieski Vodka’s suggested retail price of $10.99 for a 750 ml bottle, which is a great value. I’ve had top shelf vodkas that cost three times as much that I didn’t like as well. Now hopefully it’ll soon be available here in Washington State! Na Zdrowie! Well, you saved me the hassle of a post I had working. Two drinks that I drink alot of are Moscow Mules and Caipirinhas. I was looking at trying a meld of the two, but you have saved me the effort of working out the particulars! I’m noting this for when I get to making some ginger syrup to go with my next batch of ginger beer! Oh, by the way, a Moscow Mule should be served in a copper cup. It genuinely makes a difference in how good the drink tastes! Always happy to help out! And let me know how you like it. I’ll have to put a copper mug on the list, but I must admit, it’s going to come after silver julep cups in preference.